Hannah Quinlivan Travelling Light 2017 LED lighting and aluminium, size variable, performance drawing. As the night draws on, Holding Pattern will inscribe the darkness of the street outside Flinders Lane Gallery with light and the human voice. 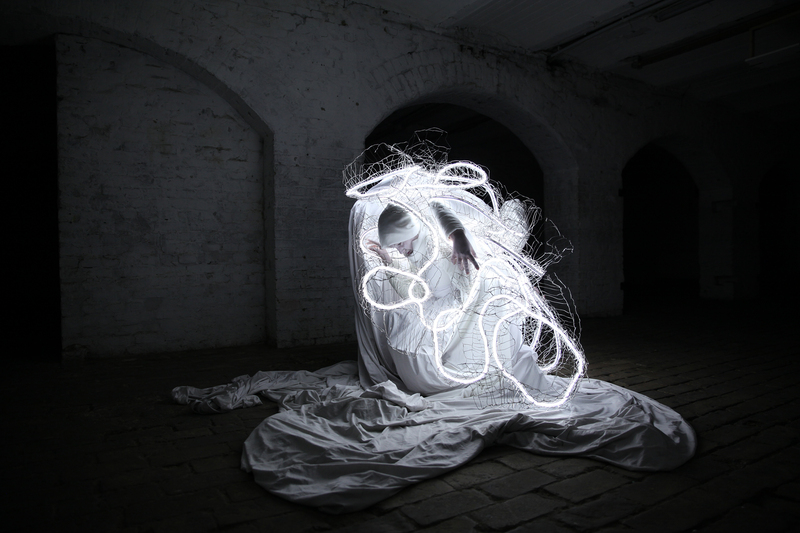 This new work by Hannah Quinlivan, in collaboration with Louise Keast and Alexandra Hobba, will combine a spatial drawing from LED lights with a performance of classical vocals that responds to the qualities of light and space. Holding Pattern interrogates the question of motion that seems to occupy our time. While some move freely – perhaps too freely – motion is haunted by its shadow, the forced immobility of those who are unable to move but cannot remain. This new work investigates the structure of feeling of a time both enamoured with and discomforted by motion, and its characteristic pattern of impulses, restraints and tones. Hannah Quinlivan has been selected by Urban Art Project curators as the sole artist whose artworks will be featured on the recently announced new Canberra Light Rail Network. In 2017 Hannah Quinlivan successfully exhibited at HONG KONG ART CENTRAL, created a major installation at Colorada State University and another major work at Canberra Museum and Art Gallery. In 2016 Quinlivan constructed a spatial drawing Arrhythmia for the National Portrait Gallery, integrating dancers and opera singers into her performance piece. Quinlivan is represented in number of collections including the National Gallery of Australia, The Australian High Commission (Singapore), Deakin University Art Collection, The Australian National University, KPMG Art Collection, Shire of East Pilbara West Australia, Philip Cox Collection, Ormond College Collection, and various private collections.